Following two stress free friendlies that saw Jürgen Klinsmann’s team sustain a 2-4 loss to a Belgium team full of star players that are being called the golden generation of Belgium football, and an exciting 4-3 win over the always tough Germans. The match against Germany saw the home teams Clint Dempsey score two goals moving up the ladder to become the country’s second leading all time goal scorer with 35 goals yet still 14 goals behind leading scorer Landon Donovan. 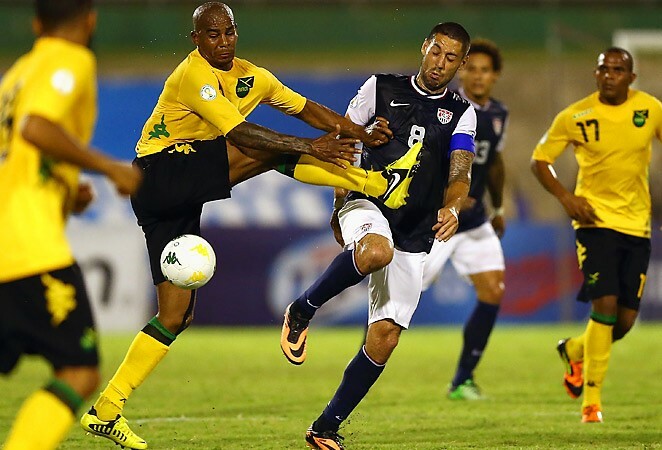 These two matches were of course designed to get the players ready for the all-important World Cup qualifier in Kingston against the Reggae Boyz of Jamaica. The Americans arrived in this tough port city 36 hours ahead of the match in order for the players to acclimatize themselves to what they knew would be a difficult opponent having lost here back in September. The game kicked off Friday night in the 35,000 seat national stadium known locally as The Office after Jamaica’s 50 match unbeaten run from 1995–2001. From that start the U.S.A. looked in control with Jamaica never threatening Tim Howard in goal, and even though they had nine shots at the net only one was on target forcing the Everton keeper to make a save. The U.S.A. always looked the most likely to score with Michael Bradley seeing his shot hit the post after only five minutes of play. The breakthrough came on 30 minutes when after Graham Zuzi beat his defender and sent a cross in for Jozy Altidor to head down past Donovan Ricketts. After the break the Americans looked as though they were happy to sit on the lead soaking up any of the pressure the Jamaicans could mount. Midfielder Jermaine Jones had to be taken off on the 56th minute following a much contested corner kick that saw the American fall hard sustaining a mild concussion and will now miss the team’s next match against Panama in Seattle next Tuesday. Geoff Cameron was brought on to pair up with Michael Bradley as the U.S. looked to be cruising to a 0-1 victory until in the 88th minute the Reggae Boyz got a free kick in a dangerous location, and knowing that the match was all but over saw substitute Jermaine Beckford who was offside to everyone except the referee, linesman, and the 20,000 screaming crowd head in the equalizer for the home team. It looked now very much as if the match was doomed to end in a tie until in stoppage time the Americans got a corner that was taken short to Bradley who passed to Evans who turned and shot scoring a late winner that almost certainly will see the United States qualify for a place in next summer’s World Cup in Brazil. The match finished 1-2 in favour of the Americans thanks to Evans late winner that gives the U.S.A. seven points and see’s them top their World Cup qualifying group tied with Costa Rica. It was the Seattle Sounders Midfielder Brad Evans first goal for his country, and it could not have come at a better time.